The Hakka people have become known for a type of folk song known as Hakka Hill Songs. These rural songs are sung exclusively in the Hakka language and many of them are over 1,000 years old! Originally they were designed as a method of communication over distance. Since the Hakka people mostly live in mountainous regions, singing was a better means of communication than the spoken word because the higher pitch of sound would carry further. Some people even believe that in the past they were used as a method of flirtation between young men and women. So next time your mobile phone has no signal, just try singing instead! The theme of the songs can vary from love to personal etiquette, although some focus on more sombre topics such as hard work and poverty. Nowadays many Hakka Hill Songs are improvised on the spot and convey a specific message or express the singer’s feelings. The lyrics may also contain puzzles as a way to entertain or challenge the listener. Other singers will then answer the puzzle in the form of another song with a similar tune. 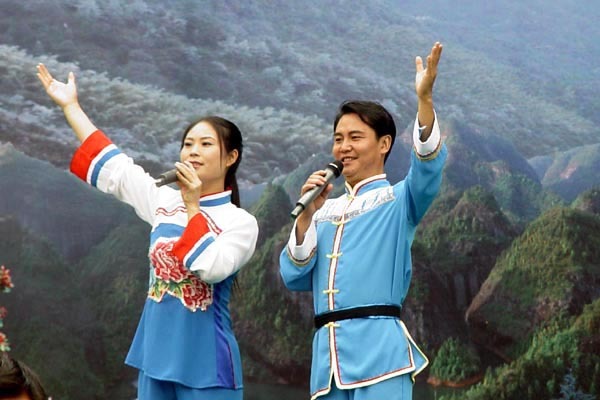 Guangdong’s Meixian Prefecture is home to many Hakka people and they frequently hold Hakka Hill Song competitions, where they invite competitors from across China to participate in battles of wit and melody!